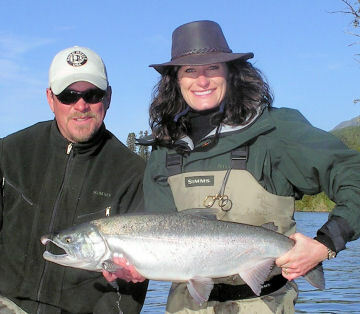 If you are thinking about Alaska salmon fishing, then you have many good options. Premium lodges offer fly-in trips with steep price tags, but if you can afford to go, by all means give it a try. Outfitted rafting trips or tent camps are more economical for hardier anglers. Do-it-yourself rafting trips can offer experienced outdoorsmen a fantastic experience. Daily fly-in trips can provide quick access to salmon filled streams. The road system also offers many options. The Kenai River supports some of the largest salmon in Alaska and is best known for producing the world record King Salmon. Sockeye salmon flood the river each summer and the Kenai also produced the record sockeye. 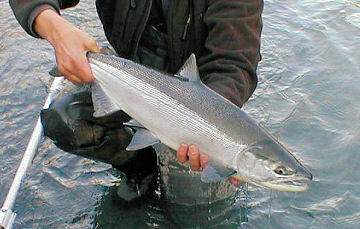 Silver Salmon follow from late summer into the winter months and although the Kenai does not currently have the record, we do see silvers from 15-20lbs. 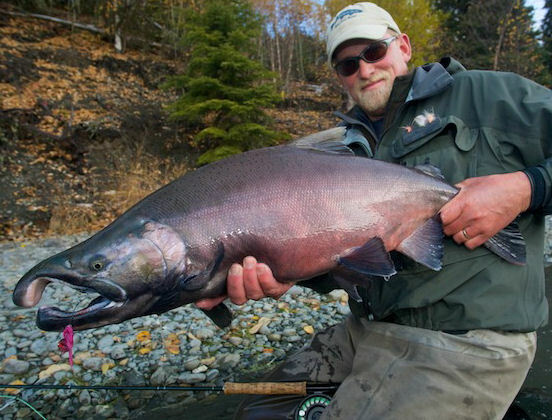 Pink Salmon, for the most part, run every other year (even calendar years) and can provide great sport for anglers who want to catch a ton of fish. The Kenai features both tributary bound and main stem-spawning runs, with salmon available from May through October. The Kenai is easy to access from Anchorage by rental car, and there are plenty of accommodations to choose from. Many folks who fish around Alaska either add the Kenai to their yearly itinerary, or make it their sole focus. It is that good. Flowing from 20-mile long Kenai Lake to Cook Inlet, the Kenai River drops 430 feet on its 82-mile course to the ocean. The 17 miles of river from Kenai Lake and the little town of Cooper Landing, to 15-mile long Skilak Lake, is known as the "Upper Kenai". This section is where much of the fly-fishing takes place. From the confluence of the Russian River, and onward to Skilak Lake, the river is entirely within the boundaries of the Kenai National Wildlife Refuge. The Upper Kenai is drift only (no power boats). This adds immeasurably to the quality of the experience. Sockeye salmon bound for the Russian River are available when the season opens on June 11 and can be caught into Early July. Waves of sockeye headed for Quartz and Ptarmigan Creeks begin passing in mid July, with the volume peaking somewhere later in the month and continuing into August. Silvers trickle through in early August, but begin to present in fishable numbers shortly after mid month. Fishing for silver salmon can remain strong through October. The Kenai River flows from Skilak Lake for fifty miles before emptying into Cook Inlet. The first five miles are still within the Kenai National Wildlife Refuge. It starts out wide and slow, providing excellent summer habitat for loons, nesting swans and juvenile salmon. As the river picks up speed, so does the fishing. While drift boats are common, motors can be used below the lake. This can mean easy access to some fantastic fishing stretches, but also more crowded conditions at times. Despite the pressure though, the payoff can be huge. With 50 miles of river to spread out in, there are often some very productive stretches without crowding. There are also times when fishing within the busy zones will provide such good action, that anglers are perfectly happy to share the river. Much of the powerboat pressure remains in the lower 20 miles of river and within the tidal zone. 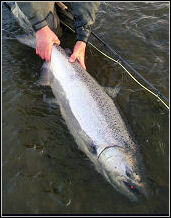 Salmon Fishing "On The Fly"
All of our salmon can be taken on the fly. We'll focus our angling efforts on the salmon at times and even incidentally hook them when chasing rainbows. The great thing about the Kenai is that on any given day, anglers can catch both large salmon (possibly a limit for the table) and impressive Rainbow Trout and Dolly Varden char. Many of our guests love to catch a limit of sockeye or silver salmon first, and then trout fish for the remainder of the day.